Today we fielded a new optional folder called SaneArchive. This option keeps the total count of Sane folder emails to a maximum of 5000. The 5001st oldest email will automatically be filed into the SaneArchive folder. We’ve discovered that as we get better and better at separating the unimportant email into SaneLater, our users spend less and less time processing (filing,deleting) those emails. So the number in that folder simply grows and grows. We have always labeled the most recent 5000 emails. So when we see the 5001st email, we will unlabel the oldest one, put it back into the INBOX, to bring the total under our quota. SaneArchive, when active, will act as a repository for these oldest emails. So, instead of putting the old ones back in the INBOX, we will put them in SaneArchive. We could simply “archive” them in gmail, but then we would not be able to reverse the process if you should decide you hate the folder or our service. If you turn SaneArchive “off”, we simply return it’s emails to your INBOX. 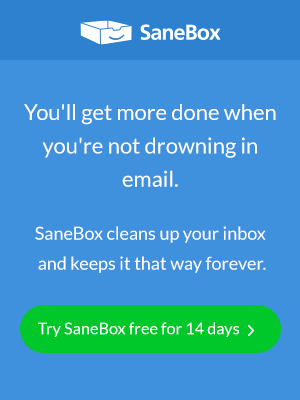 If you “cancel” the SaneBox service, we simply return all Sane folder emails, including the SaneArchive folder emails, back to your INBOX. In either case, your INBOX looks just like it did before you clicked. If you want to force an old email to stay in your INBOX: simply “flag” or “star” it.